Two Western Shoshone elders assert their right to land title in order to protect sacred and environmentally sensitive lands threatened by gold mining interests backed by the US government. The Tse keh Nay people convince BC government to reject Northgate Minerals' proposal to dump acid tailngs into a pristine lake on their territory. After indigenous peoples' houses were burnt to the ground on land owned by a Vancouver mining company, Avi Lewis gets the company's version of events. 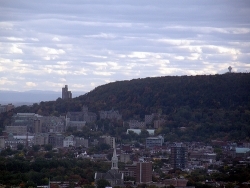 HALIFAX - In September of 2007, the United Nations adopted the non-binding Declaration on the Rights of Indigenous Peoples. Four high profile countries notably voted against the declaration - namely Canada, the United States, Australia and New Zealand. All four countries are states that were established by white settlers on indigenous lands, and all four are currently in disputes with indigenous peoples over land and sovereignty. The Canadian state, built on the theft and occupation of indigenous lands, continues to benefit from its unjustly acquired assets. Equipped with an ultra-security state apparatus, Canada's repressive and suppressive anti-terrorist and security measures have historically struck hardest against those that have the most to gain, namely aboriginal nations and their legitimate claims for their rights to land and dignity. » continue reading "Criminalizing Indigenous Rights in Canada"
The Québec Native Women's Association has called upon the Canadian government to acknowledge that residential schools were an act of genocide. The heinous crimes committed against Aboriginal children who were victims and survivors of the Residential School experience must be dealt with beyond mere apologies and monetary compensation. » continue reading "Québec Native Women's Association responds to Harper's apology for residential schools"